Why eat crap food when you don't have to? Better yet, why eat healthy food that doesn't taste good? There's no need to do that ever again with Juli Bauer's Paleo Cookbook. 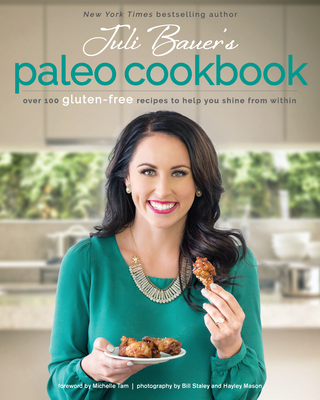 New York Times bestselling author of The Paleo Kitchen and creator of the popular website PaleOMG, Juli is a well-known Paleo cook who creates meals that are sure to please the whole family. And this cookbook is her best one yet Absolutely no one will complain when you serve them delicious dishes like Breakfast Tacos, Buffalo Chicken Casserole, Slow Cooker Short Rib Tostadas, Pistachio Rosemary Lamb Chops, and Layered Flourless Chocolate Cake. For most people, the Paleo or "caveman" diet seems unrealistic. "You expect me not to eat cake anymore?" was Juli's first reaction. (There may have been a few curse words thrown in there, too.) For Juli, that just wasn't going to work. We all understand that cavemen didn't eat cake back in the day, but we're here in the future, and we can create Paleo-friendly cakes. So Juli ventured out to put a new spin on eating like a caveman. After two weeks of eating Paleo, she knew she was in it for the long haul. She has been eating Paleo for five years now, and she consistently gives her readers Paleo recipes that bring back childhood meal memories or just bring back the foods they love the most. There's no need to be a true, pretentious caveman if you don't have to be We see you using Instagram over there, you modern caveman, you. Paleo is about so much more than just food. To Juli, Paleo is what gave her the freedom to feel healthy, energetic, and enthusiastic about life. And that's exactly what she is trying to bring to you in this cookbook. She hopes not only to help you revamp your kitchen and excite your taste buds, but also to help you feel confident with the new lifestyle you've taken on. Juli Bauer was once called the Chelsea Handler of Paleo. She's not sure if it was intended as a compliment, but that is how she is taking it. Juli is out to make you laugh on her website and in her newest cookbook. And if you don't laugh, she'll teach you how. Juli is the New York Times bestselling author of The Paleo Kitchen and the creator of one of the most-visited Paleo websites, PaleOMG. She started her website to share her homemade Paleo meals, but now it's where she shares her life stories and experiences. From fitness to fashion to body image issues, you'll find it all on paleomg.com. When Juli isn't in the kitchen, she's coaching or working out in her CrossFit gym, feeding her passion for fitness. Or you'll find her on the couch, cuddling with her French bulldog, Jackson. They are best friends. They reside together in Denver, Colorado, continuously loving the sunshine.